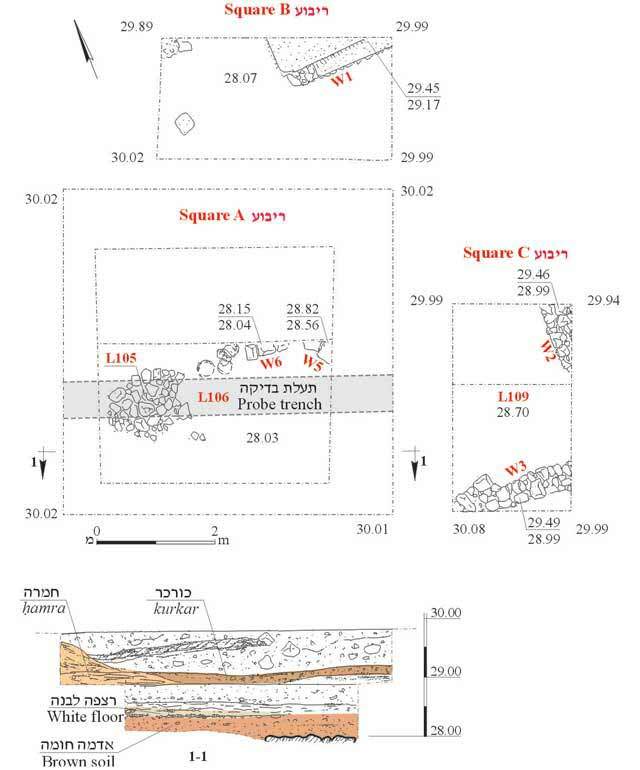 During May 2006, a trial excavation was conducted at Zarnuqa (the Qiryat Moshe neighborhood) in Rehovot (Permit No. A-4790*; map ref. NIG 180061–73/643131–44; OIG 130061–73/143131–44), prior to construction. 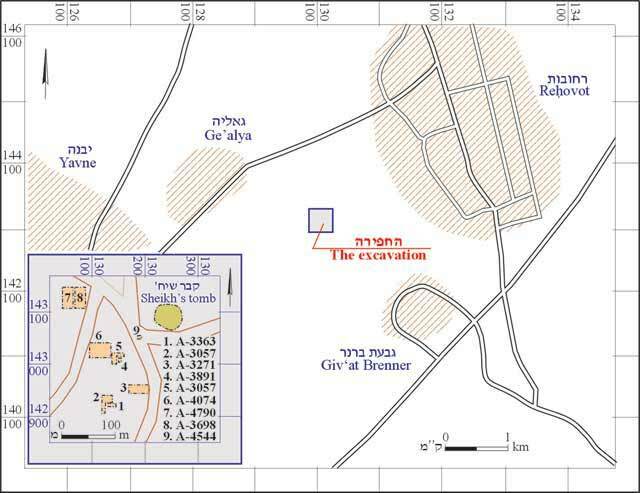 The excavation, carried out on behalf of the Antiquities Authority and funded by the contractor A. Cohen, was directed by A. Glick, with the assistance of E. Bachar (administration), A. Hajian (surveying and drafting), T. Sagiv (photography), M. Avissar and P. Gendelman (pottery). Zarnuqa is located in the western part of Rehovot, near the Yavne-Rehovot highway (Fig. 1). Zarnuqa was a village located in the district of Gaza during the Mamluk and Ottoman periods. Numerous excavations were conducted at the site (Fig. 1) exposing remains of the Byzantine (HA-ESI 114:71*), the Early Islamic (HA-ESI 115:80*) and the Ottoman (HA-ESI 119) periods. In the excavation one square and two half-squares (Fig. 2) were opened in which remains from the Persian and Ottoman periods were discovered. In the western part of Square A, a floor made of small and medium-sized stones (L105; 1.30×1.85 m) into which a large fragment of a basalt grindstone was set (Fig. 3:10), was exposed. East of the floor were fragments of pottery vessels, including bowels (Fig. 3:1, 2) and a cooking pot (Fig. 3:4). Next to them, the scant remains of a wall (W6), built of dressed stones and oriented east–west (0.23 × 0.70 m), were preserved only a single course high. The pottery from this stratum included a storage jar rim (Fig. 3:6) and fragments of imported amphoras that dated to the Persian period. Five secondary phases at the site were ascribed to the Ottoman period. The earliest phase (VI) consisted of a stone wall (W5) that was exposed in the eastern corner of Square A. It was built of a single course of two large stones (length 0.52 m) that were aligned north–south and sealed by two floors (Phase IV). On the western side of the wall, in a layer of brown soil, were pottery sherds that dated to the Ottoman period, along with a residual jar sherd from the Persian period (Fig. 3:5). 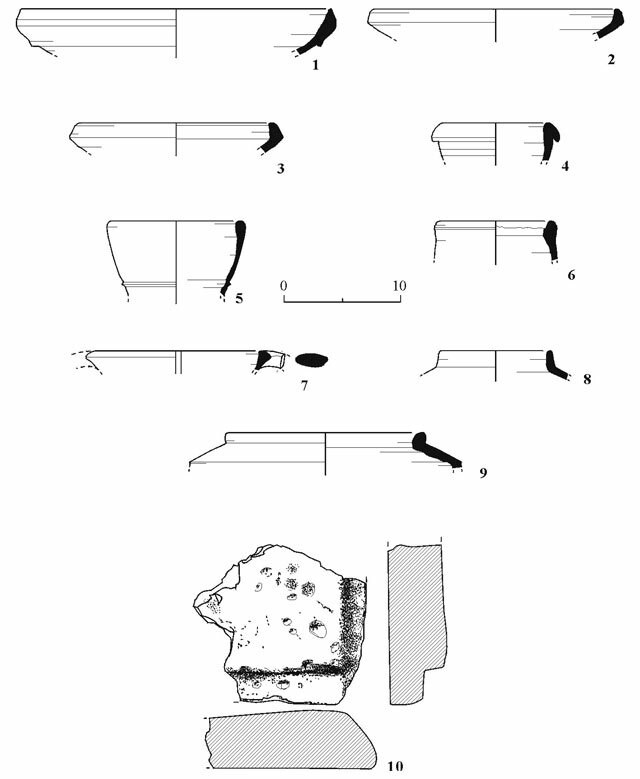 This phase should probably be consolidated with Phase V to which a floor of small to medium-sized stones (Ll09; 2 × 2 m; Square C) and a hearth in the southern corner belonged. The floor, which was lower than the kurkar floors of Phase VI in Square A, was below Walls 2 and 3. This phase was also dated to the Ottoman period based on an associated bowl sherd (Fig. 3:3). A structure built of small to medium-sized stones (W2, W3) in Square C should be ascribed to Phase IV. The building contained plaster collapse and was dated by ceramic finds, such as jars (Fig. 3:7, 9), to the Ottoman period. Also attributed to this phase were two crushed kurkar floors in Square A; the bottom one sealed an excavated channel. Phase III, dated to the Late Ottoman period, was manifested in Square A by a stone and cement construction and floor tiles. In the northeastern part of Square B the corner of another building (0.84 × 1.78 m; W1), whose walls and floor were built of cement with a foundation of a small stone layer (7–8 cm), was discovered. In the northwestern part of the square was a foundation beam of reinforced concrete. Ottoman pottery sherds of a jar (Fig. 3:8) were found in its fill. In Square C a habitation level of gray soil that dated, together with Phases II and I, to the twentieth century was discovered. Thus, during the course of the excavation, seven phases that belong to three different cultural periods were exposed. Phases I and II are attributed to modern activity, Phases III–VI represent an Arab settlement that was present in the Ottoman period. Phase III dates to the end of the nineteenth–beginning of the twentieth centuries and Phases IV–VI are earlier. The earliest phase (VII) belongs to a settlement from the Persian period; unfortunately only a few artifacts were recovered from it. The main significance of the excavation is the discovery of this Persian-period stratum, a period that was previously unknown at the site. 1. Location map and previous excavations at the site.